How better to beat the heat this summer than by splashing through Florida’s top waterparks? Aquatic fun includes everything from wave pools and thrilling water slides to lazy rivers. Even better? 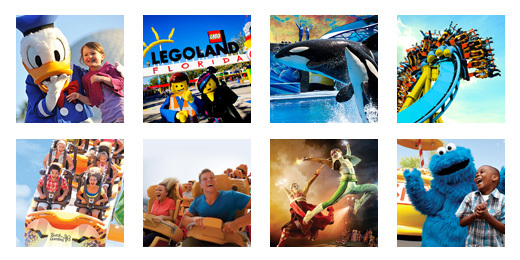 At TicketsatWork.com, you can save big on all six of Florida’s best waterparks. Grab your favorite flip-flops and swimsuit (don’t forget the sunscreen) and dive in to these watery playgrounds. A perfect mix of aqua adventure and tropical cool, CoCo Key Water Park is a family-friendly water park that features exhilarating water slides and refreshing swimming pools. Located in sunny South Florida, Rapids Water Park showcases an amazing variety of action-packed water slides, including dual seven-story speed slides, and a quarter-mile lazy river. There are also slides for children and toddlers. Get ready for 30 acres of thrilling attractions! Slide, splash and build your way to fun at Legoland Water Park. Designed for families with kids, the water park features six fantastic zones including the Lego wave pool and the Build-A-Raft river. There are tube slides, body slides and interactive water-play structures. Toddlers will rule at the water play area that has shorter slides and interactive, larger-than-life Duplo creatures. Disney’s 56-acre Typhoon Lagoon features thrilling waterslides, raft rides, a children’s play area and a giant wave pool at the Walt Disney World Resort. Soak up the fun under the Florida sun – plunge down rushing rapids, relax on a sandy beach, glide down a lazy river and enjoy the thrills and spills of the all-new whitewater journey called Miss Adventure Falls. The second of two water parks in Walt Disney World Resort (along with Typhoon Lagoon), Disney’s Blizzard Beach features waterslides, raft rides and a one-acre wave pool. Zip down the slushy slopes of Mount Gushmore on one of the world’s tallest and fastest waterslides. Float down the tranquil river and relax with a good book on the white-sand beach. Escape into water-soaked excitement at Adventure Island! Ease into island time in a place where you’ll discover corkscrew slides, waterfalls, a giant wave pool, a rambling river, tube rides, kid-friendly attractions and much more!